Sunday primetime belonged to NBC’s afternoon NFC playoff football game and the 76th annual Golden Globes — all anything else could do is get in line. Airing all originals, CBS was No. 2 on the night in total viewers. The net tied with ABC — a mix of originals and encores — for second place among adults 18-49. Fox was fourth by both metrics. Due to the nature of live telecasts and how time zones work, the below fast-national Nielsen numbers for NBC should be considered subject to significant adjustment. 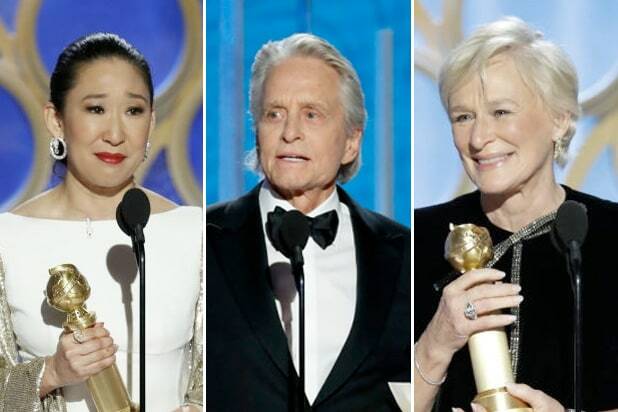 Click here to see how the Globes did in the more-accurate metered-market ratings. Final national numbers should be available soon. Per the fast nats, NBC was first in ratings with a 6.2 rating/23 share in the advertiser-coveted 18-49 demographic and in total viewers with an average of 21.2 million. NBC, which will easily remain in first place no matter what Nielsen data stream you eventually look at, benefitted from an hour of playoff football making it into primetime before the Globes took over for the next three hours. CBS and ABC tied for second in ratings, both with a 0.8/3. CBS was second in total viewers with 6.8 million, ABC was third with 3.8 million. For CBS, “60 Minutes” at 7 p.m. had a 0.8/3 and 7.1 million viewers. At 8, “God Friended Me” got a 0.9/3 and 4.8 million viewers. “NCIS: Los Angeles” at 9 received a 0.9/3 and 7.5 million viewers. At 10, “Madam Secretary” closed out primetime with a 0.6/3 and 5.4 million viewers. For ABC, following a rerun, “America’s Funniest Home Videos” at 8 had a 0.9/3 and 4.8 million viewers. At 9, “Shark Tank” got a 0.9/3 and 3.7 million viewers. A repeat followed. Fox was fourth in ratings with a 0.7/2 and in viewers with 1.7 million. After a pair of reruns, “The Simpsons” at 8 had a 0.9/3 and 2.4 million viewers. “Bob’s Burgers” at 8:30 got a 0.9/3 and 2.3 million viewers. At 9, “Family Guy” put up a 1.0/4 and 2.4 million viewers. “Rel” at 9:30 received a 0.5/2 and 1.2 million viewers. Univision was fifth in ratings with a 0.4/2 and in viewers with 1.6 million. Telemundo was sixth in ratings with a 0.3/1 and in viewers with 691,000. The CW was seventh in ratings with a 0.1/0 and in viewers with 520,000, airing only repeats.